WiFi Detecting Watch Doesn't Look Half Bad | OhGizmo! If your city doesn’t have a reliable warchalking community, you’ll need to find another way to hunt down available wifi hotspots. And while there are plenty of pocket sized detectors already on the market, wearing this wifi sniffing watch from ThinkGeek won’t immediately brand you a nerd. 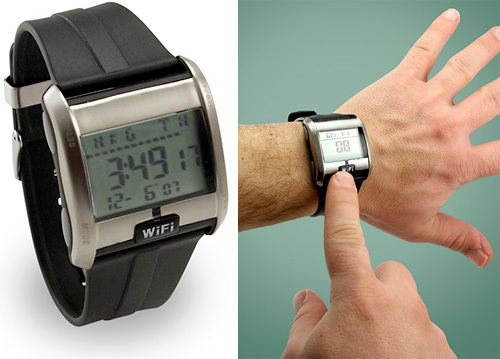 The steel case and retro-digital watch face are well styled, but the watch can also tell you the signal strength of a nearby hotspot on a scale of 0 to 8, as well as what type of wireless connection it is. It also has a daily alarm, a countdown timer, an electroluminescent backlight, a calendar and world time mode. While I’d probably upgrade the rubber watch band, the $29.99 price tag from ThinkGeek is pretty reasonable.